Why do we estimate emissions? The National Inventory System applies to the Greenhouse Gas Inventory only. This page contains information split into various sections, you can jump directly to a section using the links below. The National Inventory System (NIS) is a requirement of the GHG Inventory only. However, the benefits of the system apply to the AQ inventory also. The Marrakesh Accords of the Kyoto Protocol (Decision 20/CP7) define the requirements for National Inventory Systems (NIS), including the need to establish legal, procedural and institutional arrangements to ensure that all parties to the Protocol estimate and report their GHG emissions in accordance with relevant decisions of the COP, facilitate UNFCCC Reviews and improve the quality of their inventories. Under related EU legislation set out in Decision 280/2004/EC, the UK was required to have in place it's NIS by 31st December 2005. The development of more formal agreements between BEIS and Key Data Providers (KDPs) is ongoing and a number of formal Data Supply Agreements (DSAs) are now in place. The figure below shows the main elements in the UK NIS. BEIS is the Single National Entity responsible for submitting the UK's GHGI to the UNFCCC. 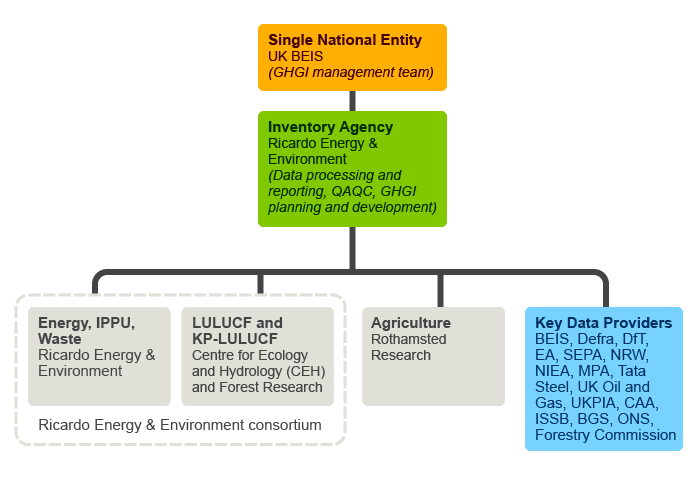 Ricardo Energy & Environment compiles the GHGI on behalf of BEIS, and produces disaggregated estimates for the Devolved Administrations within the UK. Key Data Providers include other Government Departments such as Department for Environment, Food and Rural Affairs (Defra) and the Department for Transport (DfT), Non-Departmental Public Bodies such as the Environment Agency for England and Wales (EA), the Northern Ireland Environment Agency and the Scottish Environment Protection Agency (SEPA), private companies such as Tata Steel, and business organisations such as UK Petroleum Industry Association (UKPIA) and the Mineral Products Association (MPA). Energy statistics required for compilation of the NAEI are obtained from the Digest of UK Energy Statistics (DUKES). DUKES is compiled and published by the Department for Business, Energy & Industrial Strategy (BEIS). DUKES is available on the BEIS website. Reporting annual emission estimates to these UK inventories is a statutory requirement for industrial operators of installations regulated under the Integrated Pollution Prevention and Control (IPPC) regulations and Environmental Permitting Regulations (EPR). The data from these inventory sources is also used to quality check data provided by companies directly to Ricardo Energy & Environment. Rothamsted Research compiles the inventory for agricultural emissions using agricultural statistics from Defra and the Devolved Administrations. 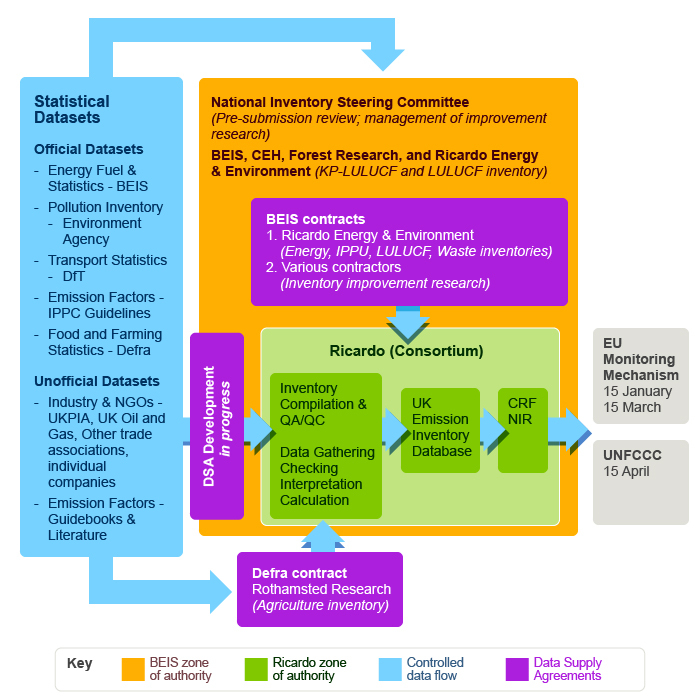 The Centre for Ecology and Hydrology (CEH) compiles estimates of emissions and removals from LULUCF using land-use data and information on forestry from the Forestry Commission (a non-departmental public body), Government Departments and from other sources. Both BEIS and Defra also fund periodic research contracts to provide emission estimates for certain sources such as fluorinated gases and landfill methane and to provide estimates for previously unreported emission sources.